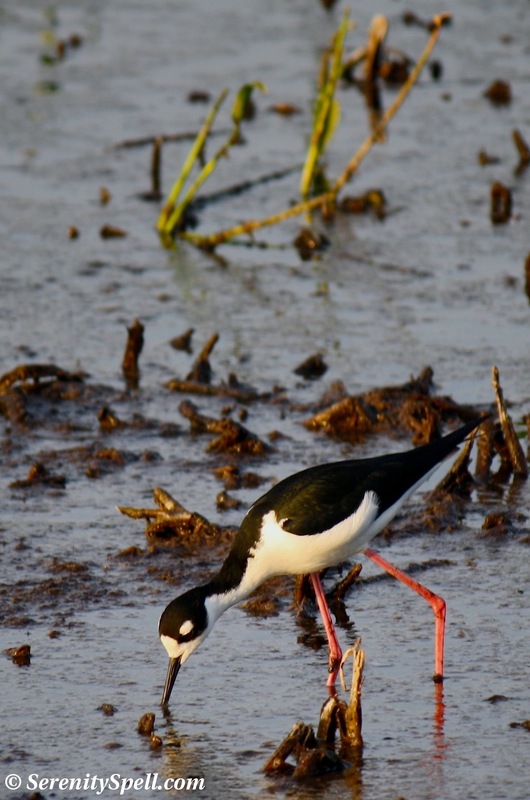 Black-necked Stilts (Himantopus mexicanus) are abundant residents of coastline, estuarine, and wetland habitats. They’re found across the country, from California to Florida, and through to Peru, northern Brazil, and the Galapagos islands. The Northern populations migrate south in the winter months. 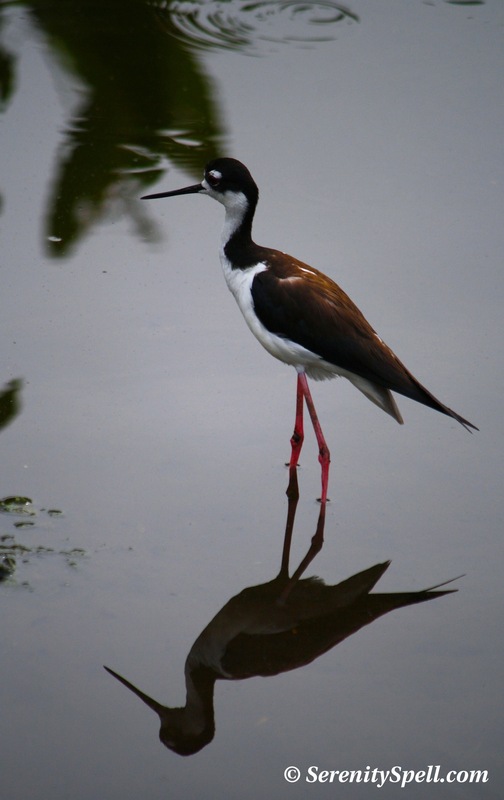 Adult Black-necked Stilts have long pink legs, a thin black bill, and are white with a black cap, neck, and back. They forage in the shallow waters of our wetlands, wading and probing for aquatic invertebrates and small fish. It’s a common sight to see them resting on the small “islands” of our wetlands, surrounded by water. The nests are constructed by both the male and the female, at ground-level and often close to the water’s edge, in semi-colonial formations (loose clusters), with peak nesting activity in June. Here, I came upon a young stilt carefully guarded by its parent. I didn’t stay long, because my presence — despite my great distance on *dry land* — was disturbing the adult. 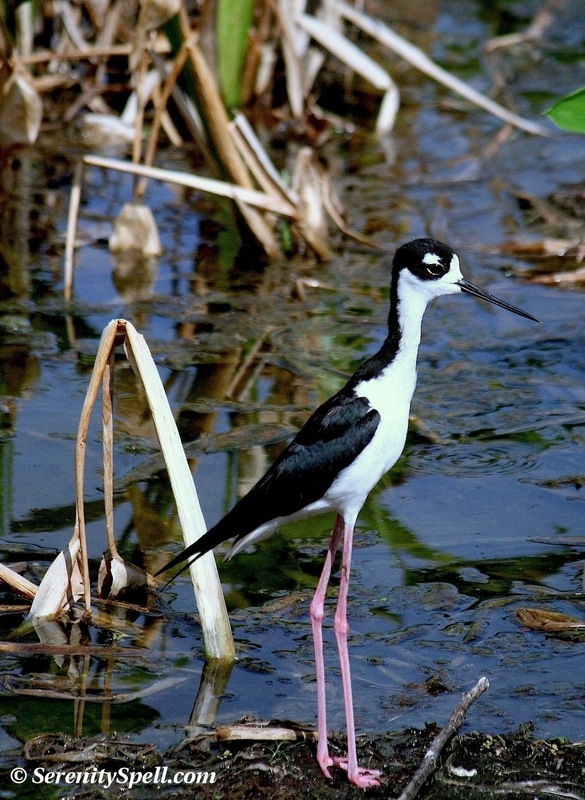 I love seeing these guys in our wetlands: always in pairs, tuxedoed, debonair and elegant, but oh-so-shy. Fun fact: Proportionate to their bodies, silts have the second-longest legs of any bird — exceeded only by flamingos. long neck, skinny body, long legs, wow they have a perfect figure 🙂 great shots, FeyGirl. as always. Hahahah! That’s great… And they don’t have to wear black, do they?? Super! You got a shot of junior! Excellent. Love these photos thank you for sharing. Aren’t they dapper little guys? Very elegant (but timid) birds… I love seeing them in our wetlands! Heh, well put! I’m so glad you enjoyed these dapper little guys, as much as I do — they’re really unique. 🙂 Have a wonderful day! How sweet junior is. Funny, I thought Great Blue Herons or Sandhill Cranes had super long legs. I love the tuxedo look, matches my tuxedo cat…although she’d never get her toes wet without a fight. I was thrilled to see a juvenile — these guys are so timid, that they’re usually far out in the wetlands, and quite skittish. I adore their coloring, too! Great Blues and Sandhills *do* have long legs (many of the waders do), but proportionately-speaking, these guys rank higher — they do look more gangly than the herons. Thanks so much! Heh, another (female) commentator replied — long legs, long neck, what do they have to worry about? Love it! Hahaha, exactly. Maybe the tux have to go, just maybe. Glad we have these beauties here in CA and not alligators. Hahahah! But you guys have other critters — bear and puma, yes? Oh, now you’ve spoiled it. I do have to think ‘mountain lion’ locally, but not seen any walking. Only heard a bear when sleeping in tent cabin in Yosemite. I have never seen them before, but now I’ll have to start looking for them. Interesting and pretty birds! I’ve never seen one before. I’m glad you got to see a new one! 🙂 They’re really unique little things… Dapper but always spooked, so I was happy to see a juvenile. I love the weirdness of these guys; they crack me up every time I see them. Neat to see a picture of a juvenile! Thanks for sharing. SO true! Weird and elegant at the same time — and they’re always so shy and spooked! I was excited to see a juvenile too, since they’re so timid and usually hidden or really far out in the wetlands. Glad you enjoyed! I should imagine they are rather popular with the men, based on their leg ratio. …and such lovely pink legs! Rivaled only, perhaps, by the Black Oystercatcher. Exactly! Check out those gams… Show off. What funny (and lovely) looking birds. 🙂 Great shots, as ever. A very elegant parent – with such a charming baby! Very striking captures! 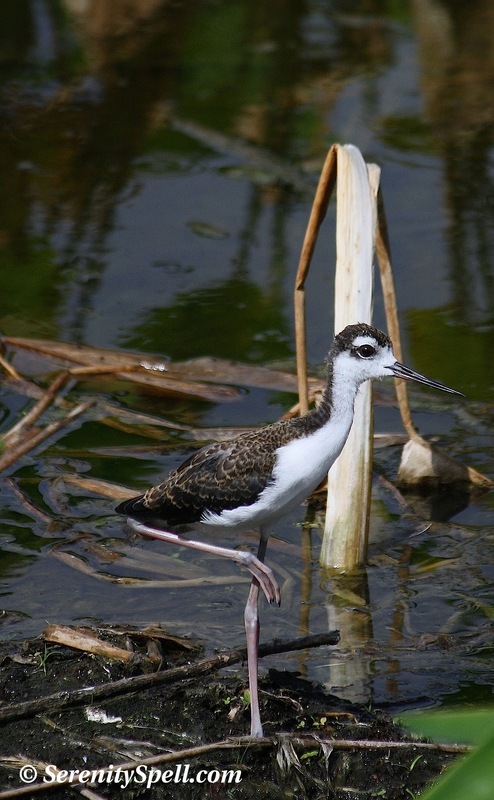 I’m about an hour from the beach; no stilts there – but there’s a place called Malibu Lagoon where they can be sighted, along with other birds I’ve never seen in the wild – Boyfriend and I have made it a point to visit this nirvana. They really are elegant and dashing, yes? Usually quite shy, so I was happy to spot her baby. Thanks so much! Thanks so much! They’re lovely to photograph — I was thrilled to catch some nearby, and with a juvenile (they’re usually too far off in the wetlands).